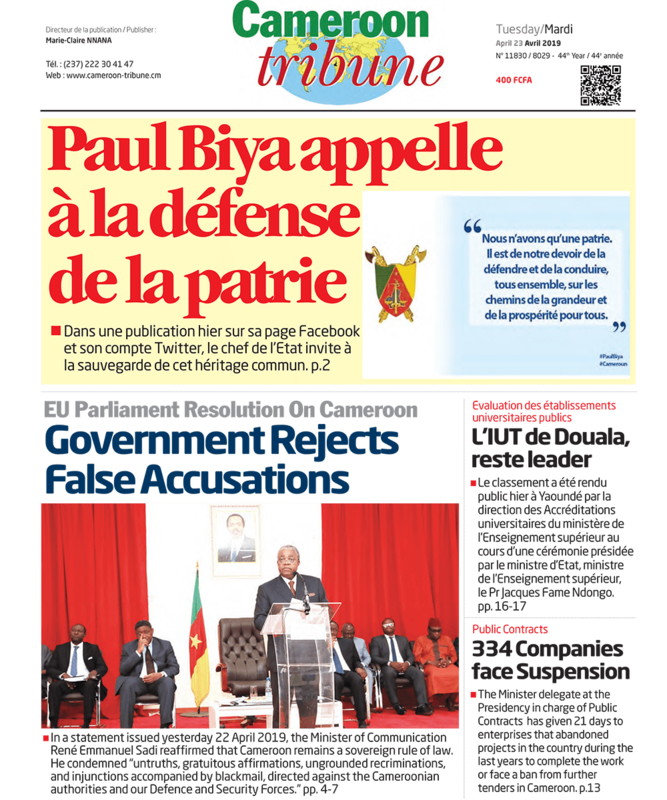 After proving to his compatriots that he is a leader who listens to his people and acts in their interest with respect of the norms of prudent leadership, President Biya yesterday went a step further. The Cameroon Head of state in reaction to the longest strike action that has taken place in this country since the reunification of Cameroon, had started by listening to the demands of Cameroon’s Common Law lawyers and teachers of the primary, secondary and Higher sectors. The massive recruitment of Grade I teachers, the posting of bilingual teachers to schools in Cameroon west of the Mungo, the grant of FCFA 2 billion to denominational schools, and the creation of the National Commission for the Promotion of Bilingualism Culturalism portrayed the president’s concern to weather a storm that was fast becoming devastating. That in spite of what he had done, schools remained closed in the North West and south west regions, was indeed such a disturbing scenario that no patriotic Cameroonian could have been at ease with himself. Worse, detractors most of them abroad hardly appreciated the goodwill that had already been demonstrated, and consequently cooperate in appealing more for calm in action, than violence in anger. Ghost towns in the Anglophone regions and closure of schools cost not only our children, but parents, and the country’s future as well. This could not be allowed to continue. That is why patriotic Cameroonians have been calling on children to return to school on Monday 4 September, 2017. Religious denominations, traditional authorities, parents and associations have joined in this crusade to end an unpleasant surprise that has been tarnishing the image of our peace-loving country. In continuation of this crusade to stall the nightmare, President Paul Biya yesterday ordered the discontinuance of the proceedings pending before the Yaounde military Tribunal against Messres Nkogho, Felix Agbor, Fontem Aforteka’a Neba, Paul Ayah Abine and some other persons arrested in the N.W and S.W regions because of the crisis in the Anglophone regions. This release is an act of clemency aimed at portraying and instilling a scenario of peace, stability and elements of fruitful dialogue, which should be appreciated by Cameroonians with a concern for peace, stability and progress. It is an act of love of the country and its future; a fatherly act indeed aimed at keeping together a family that must remain united and strong despite the actions and caprices of detractors at home and abroad.